Thank you for traveling down this morning for the show. Tell us about the Upstate. Have you always lived there? What’s your community like up there? You’re a writer, we met through the South Carolina Writers Association. 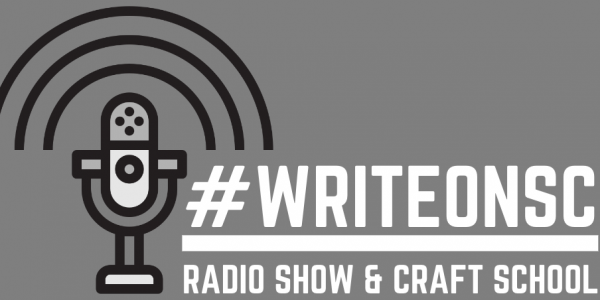 Tell our listeners what you write and a little about your writing journey. Do you have a preferred genre? Who’s your favorite author? What’s your writing process like? Do you query or submit your work? How has your experience with critique groups been? Do you like them or hate them? So, the publishing world is experiencing some serious disruption right now. A while back we had Cheryl Nugent on the program talking about Kentbury and the disruptive models being developed in the industry. For the sake of our non-writer listeners, let’s cover some basics. First, the traditional business model in publishing has put the publisher in the role of manufacturer. That is, the publisher decides what books to publish, edits and designs them, prints them, and then distributes them through retail channels. Two big things have challenged that industry model. First, Amazon.com became the world’s largest book distribution resource. Originally, we thought Amazon would compete with Barnes & Noble and other retail outlets. By offering more titles, having relationships with more publishers, and negotiating buying contracts that enabled them to sell at lower prices, Amazon looked like a formidable retailer. But then e-books gained momentum. Amazon got into that game, of course, by creating a device Kindle, and the means by which to access ebooks. But then they also got into the publishing space by enabling tech savvy authors to publish their own books on the Amazon platform for Kindle. In 2009, Amazon merged two platforms, BookSurge and CreateSpace and in 2011 launched its own On-Demand Publishing platform, still considered “CreateSpace” as a brand, but truthfully a wholly owned Amazon operation. The behemoth publishing outfit continues to grow through acquisitions and owns dozens of imprints, publishers, and tools including Goodreads. Amazon’s Kindle Unlimited makes accessible for a subscription rate thousands of books and has redesigned how authors are compensated. The growth of e-publishing has made manufacturing books easier. The traditional role of the publisher, someone who takes a “risk” on the author and the book by investing in thousands of copies, is up-for-grabs. Individuals can invest their own money and pay for copies — so-called “Self Publishing”; many do so by setting up a Press label, so-called “Vanity Press” because the only author printed is the publisher. Individuals with a particular knack for the tools can also offer their services in helping fellow authors to create e-books and print-on-demand copies. Some of those individuals establish Press / Publishing companies and work within a specific community or niche. When Googling Boutique Publisher South Carolina, I found a few that were focused on Christian non-fiction and inspirational texts. I know of some that publish memoir, and others that focus just on South Carolina authors. These boutique publishers have a range of expertise and services to offer. Their pricing models vary and the amount of risk they’re willing (or able) to take on varies as well. So tell us about V Press LC. Let’s start with what you consider your niche to be. Who are your customers? Tell us about the name, where did it come from and what’s the meaning behind it? How can people (readers or writers) do business with you? Submit to V Press LC here.